This is an 8 page sample of a bigger product that we love to use while finger-painting! You could use them with play doe, finger-painting, coloring, or just laminate them and use dry erase markers! Super fun for those little fingers they fit perfectly for tracing! ABC, 123, 100 party, and sight words Worksheets for Activity Centers and More! 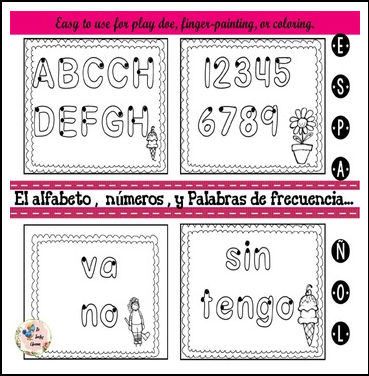 Help with reading and writing through these fun fine motor worksheets. My little guys could not wait to get started on these! They are great for activity centers, 100 party, ABC practice, writing, with sight words & high frequency words too. Great for end of the year ABC party or your day 100 party! Have fun! Please don´t forget to rate this product and follow me for the 50 follower freebies. A great freebie every 50 followers! Thetravelingclassroom por Dinah Ely se encuentra bajo una Licencia Creative Commons Atribución-SinDerivadas 3.0 Unported.